Ignoring the inevitable representation bias can cost investors money. Representation bias refers our tendency to believe that what we use to represent something else actually is what it is supposed to be describing. The speed that shows up on the dashboard of your car gives you a representation of how fast your car is actually going, same for the number that appears on the police officer's radar. Neither is the car's speed. That's why traffic courts will consider speedometer or radar calibration test results. When it comes to financial markets it can be argued that the simplest, cleanest information available is price and volume. Even those don't tell the whole story. While it is possible to invest using just price and volume as the technical data, most people choose more complex representations. When you do that, the possible distortions get bigger. The principle here is that the further you get from the raw data, the more likely you are to make the mistake of thinking that you are dealing with something that is more tangible or real than it really is, that the representation really is the thing you're trying to make decisions about. The most obvious example of one thing representing something else in investing is the daily bar chart. Investors of all viewpoints can use bar charts to make decisions about their investing. It would be pretty safe so say that 'everybody's doing it, so it must make sense. 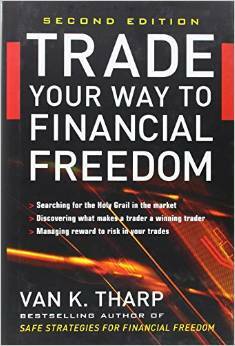 But, as Dr. Van Tharp points out in his book, Trade Your Way to Financial Freedom . . . "In reality, it's just a line on a piece of paper --- no more and no less." Knowing what the bar chart does and doesn't tell you is important. who is buying and selling. Quoting Dr. Van Tharp on the representation bias again, "The scary thing is that a daily bar, which is at best summary information, is typically the raw data that you manipulate to make your decisions."